Not a lot of new information from any of the teams. The K2 teams are still on the trek and others are still early in their climbs. 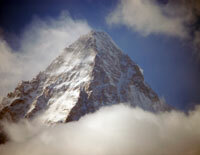 The seven member team from Kazakhstan, Russia and Kyrgyzstan are trekking towards K2 Base Camp. They are currently at the Urdukas Camp. You can follow them on Instagram but Russian Climb is the best source. The other K2 team, lead by Alex Txikon, are also trekking the Baltoro Glacier towards K2 Base Camp and at Paiyu. You can follow their movements on Alex’s GPS tracker, Twitter, Instagram, and Facebook. This team is attempting a new route on Mummery’s Spur. Daniele Nardi, British Thomas Ballard and two Pakistani teammates Rehmatullah Baig and Karim have established Camp 3 at 5,714m. American climber Lonnie Dupre is in Talkeetna, Alaska is on MT. Hunter now but had to change route due to the Icefall being “completely impassable” with all the crevasses. Best of luck to all this winter. Should helicopters be used on Everest? Yes to ferry gear to the Western Cwm, but not people. It will save lives but retain the spirit of climbing. Only for rescues. Other uses degrades the spirit of climbing.